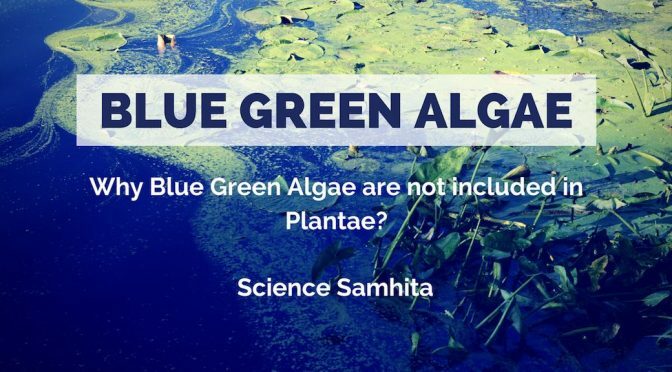 Why Blue Green Algae are not included in Plantae? Blue Green Algae also called as Cyanobacteria are one of the most successful organisms on this planet. They are gram-negative (do not take up gram stain) and photosynthetic microorganism. They have successfully survived for over 3 billion years on our planet earth. Initially, they were classified Plantae due to their ability to photosynthesis, but later they were moved to the Monera Kingdom. Why they relate to plants to look like them? If we talk about their external appearance then they quite similar to green photosynthetic algae (kingdom Plantae). Colour of blue green algae ranges from green to deep blue, often blue-green (so does their name suggests). Their color is due to photosynthetic pigments i.e. Chlorophyll and the Phycobilins ( such as phycoerythrin (red) and phycocyanin (blue)). 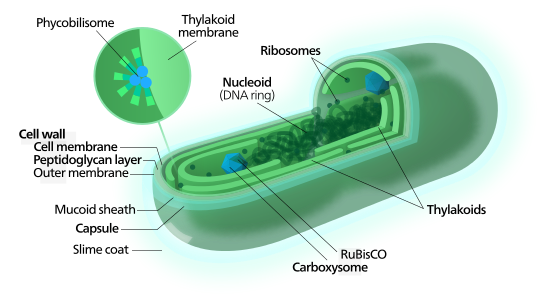 A Diagram of a Cyanobacterium (Blue Green Algae). Like plants, they are capable of oxygenic photosynthesis, i.e. they fix Carbon dioxide and release oxygen during the process. However, many of them also fix atmospheric nitrogen as ammonia. They are the most Self-contained Autotrophs, which explains their global success in survival. They also release nitrogenous compounds into their environment. As the earliest oxygenic photosynthesis, it is apparently their activity which made the earth’s atmosphere aerobic (oxygen-containing) providing the conditions for the evolution of aerobic bacteria and the eukaryotes. From above discussion, you may deduce that these organisms are quite similar to photosynthetic green plants. You may also agree to the view that cyanobacteria or blue-green algae belong to the Plantae Kingdom. But, technically that is no true. They may have some similarities to green plants but structurally they are more similar to Monerans. But first, let us know. Monerans is a prokaryotic kingdom i.e. it includes all those organisms who don’t have an internal structure like the nucleus, rather there is only a nucleoid region. Monerans consists of two major groups: The Eubacteria (true Bacteria) and the Archaebacteria (ancient bacteria). Eubacteria include several subgroups of which one distinctive subgroup is Cyanobacteria or blue green algae. Why are they included in Kingdom Monera? Cyanobacteria or blue green algae are not distinguishable from bacteria by any fundamental feature of their cellular organization. 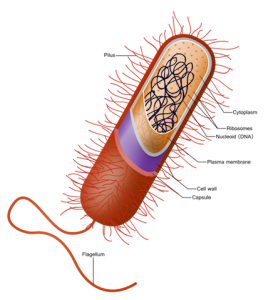 A Typical Prokaryotic Cell of Monera Kingdom. Monerans are prokaryotes i.e. they do not contain a true nucleus. Similarly, blue green algae are also prokaryotes and do not contain a true nucleus i.e. a properly defined nucleus with a membrane. Monerans have a rigid cell wall made up of peptidoglycans (polysaccharides cross-linked with small amino acids). This gives them their characteristic shape. Similarly, Blue green algae also have a rigid thick peptidoglycan cell wall. The mucilaginous sheath surrounding the cell of blue green algae and the capsule present in many Monerans poses a similar structure as both are made up of extremely fine fibrils. Like the Monerans, blue green algae also lack true sexual reproduction and reproduce asexually, either by binary fission in unicellular forms or by breaking up and regrowth of filaments in filamentous forms. Blue-green algae also fix the atmospheric nitrogen like the other members of Kingdom Monera such as bacteria and enrich the plant root environment through many nitrogenous compounds. Like many Bacteria that release the bacterial toxin, blue green algae also release toxins that are harmful to aquatic fauna. Both of them are sensitive to antibiotics. Thus, we can say that Cyanobacteria or Blue Green Algae are more related to Bacteria (Monera Kingdom) than to Plants (Plantae kingdom). Hence they were moved to the Monera Kingdom from the Plantae Kingdom. However, besides Plantae kingdom cyanobacteria have been observed to be associated with almost every type of eukaryotes: green alga, moss, ferns, flowering plants, fungi, protozoa, sponge, shrimps and even mammals. Previous PostIndian Long Pepper:​ A Potential Cancer treatment Drug.Next Post​Why are some fungi grouped under “fungi imperfecti”?